22 Jump Street could have been shorter and better written. However, it isn't exactly bad the way it is, says Paloma Sharma. Ours is probably the luckiest generation in (very) recent cinematic history. 21 Jump Street came out when we were in high school and now, in college, we have the pleasure of watching Schmidt and Jenko go undercover and do everything that we do (and don't tell our parents about), except their antics are ten times wilder. 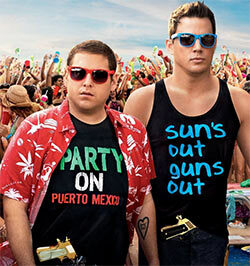 Morton Schmidt (Jonah Hill) and Greg Jenko (Channing Tatum) are out of high school and find themselves catapulted right into college - undercover, of course. There's a new drug that's being circulated around M.C. State, called WHYPHY, and Schmidt and Jenko have to infiltrate the dealers and find the supplier yet again. However, they end up doing everything but that. They start their investigation following the same formula that they had used when in high school. But they soon realise that things aren't quite what they were - neither with the investigation nor with the investigators. While Schmidt found his clique in high school, it is Jenko who is the cool one now. Jenko fits in perfectly with the jocks, becoming especially friendly with Zook (Wyatt Russell), who is almost like his twin. He starts spending almost all his time with Zook. Schmidt feels sidelined and the two find themselves drifting apart, at the cost of their investigation. Will the dysfunctional duo be able succeed in their mission or will the supplier outwit them this time? Only time and Vietnamese Jesus will tell. Since the Koreans bought their church back, Jump Street has moved across the road, into a Vietnamese church. There have been significant upgrades in the budget of the Jump Street programme, a direct reflection of the upgraded budget of the actual film, and it brings its own set of jokes with it. The flavour of the comedy is the same as it was in the prequel, but much enhanced. Jonah Hill and Channing Tatum take bromance to a whole other level, even higher than what you saw in the Will Ferrell-Jon Heder starrer, Blades of Glory. Schmidt and Jenko are almost a couple, and I say almost because the only thing they don't do is sleep together. Schmidt and Jenko have the kind of emotional intimacy that most couples would be envious of. Directors Phill Lord and Christopher Miller must have been under a lot of pressure after the huge success of 21 Jump Street but they still manage to deliver. You can tell that both the actors and the director are having fun with what they're doing because the comedy comes so easily to them. Even though 22 Jump Street causes major damage to your stomach from all that laughing, it lacks the kind of solid writing that 21 Jump Street had. The film takes its success for granted and becomes the kid who topped high school but failed to replicate the miracle in college because s/he got too confident. No film is born to succeed. Not even one with a budget of $65 million. The plot begins to fail somewhere around the interval and nothing - not even the superb casting, the hilarious dialogues and the funny parallels that it draws between bromance and romance - can save it. 22 Jump Street could have been shorter and better written. However, it isn't exactly bad the way it is. For those of you who are between the ages of 16 and 25, 22 Jump Street is probably as awesome as HFS and WHYPHY (fictional drugs mentioned in the movie) taken together. However, it might be a tad tiresome if you aren't either young or young at heart. Tatum and Hill's comic timing manages to keep you entertained despite all the film’s flaws. 22 Jump Street might fall slightly short of being as awesome as 21 Jump Street but it will surely leave you begging for more. PS: Stick around for the titles. You'll thank me later. How To Train Your Dragon 2 Contest: Win Goody Bags!